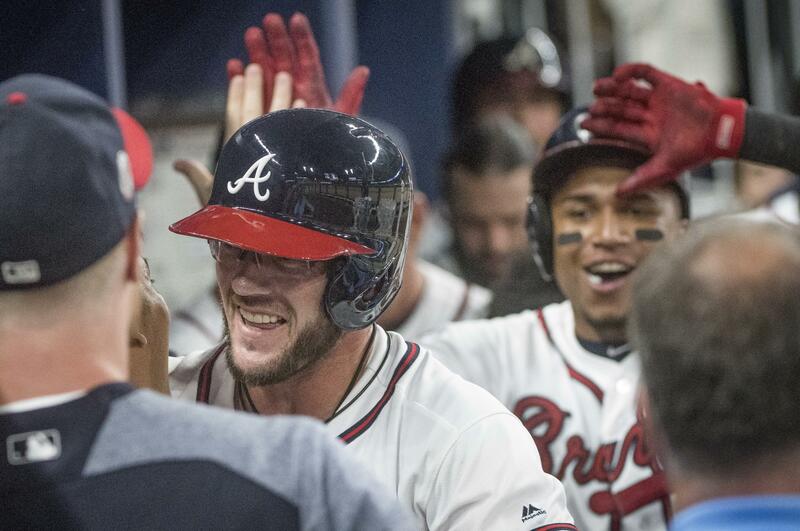 Wed., Aug. 2, 2017, 10:37 p.m.
Pinch-hitter Tyler Flowers connected for a tiebreaking, two-run homer in the eighth inning and the Atlanta Braves stopped the Dodgers’ nine-game winning streak, topping Los Angeles 5-3 on Wednesday night in Atlanta. Flowers’ shot off Pedro Baez (3-2) helped Atlanta stop the Dodgers’ major league-record streak of 53 straight wins when leading at any point of a game. The Dodgers were ahead 1-0 and 3-2. The last time the Dodgers lost after leading in a game was May 15, when they were up 1-0 before losing 8-4 at San Francisco. Rex Brothers (2-2) pitched 1 1/3 scoreless innings for Atlanta, which had lost six in a row. Arodys Vizcaino, who has taken the closer’s role from Jim Johnson, pitched a perfect ninth for his third save. Cody Bellinger hit his 30th homer for the N.L. West-leading Dodgers. Rays 3, Astros 0: In Houston, rookie Austin Pruitt and three relievers combined on a five-hitter and Tampa Bay handed Houston ace Dallas Keuchel his first loss of the season. Logan Morrison hit his 28th home run. He also connected Tuesday night, snapping his season-long 12-game homerless streak. The A.L. West-leading Astros, whose powerful offense has taken a hit with All-Stars Carlos Correa and George Springer on the disabled list, went 0 for 9 with runners in scoring position and were shut out for the second time in a week. Pruitt (6-2), who grew up in suburban Houston and attended the University of Houston, allowed five hits in a career-high 6 1/3 innings. Alex Colome got his 32nd save. Keuchel (9-1) allowed seven hits and three runs over five innings in his second start since missing almost two months with a pinched nerve in his neck. The lefty ace was better than he was in his previous start, when he lasted just three innings and gave up three runs at Detroit. Diamondbacks 3 Cubs 0: In Chicago, Zack Godley pitched three-hit ball over six scoreless innings, Jake Lamb drove in all the runs and Arizona beat Chicago. The loss was just the fourth in 18 games since the All-Star break for the N.L. Central-leading Cubs. The defending champions got shut down by Godley after pouring on a season-high 16 runs in Tuesday’s romp. Lamb hit a two-run double against Jake Arrieta (10-8) in the sixth and an RBI double off Justin Wilson in the eighth. Godley (5-4) was every bit as stingy after tossing seven scoreless innings in a win at St. Louis last week. Fernando Rodney got his 23rd save in 28 chances. Tigers 2, Yankees 0: In New York, Jordan Zimmermann pitched seven sharp innings, Justin Upton hit an early RBI double on the 10th anniversary of his major league debut and Detroit downed New York in a game that included 4 hours, 37 minutes of rain delays. Zimmermann (7-8) allowed six hits, walked none and struck out six. Scheduled to begin at 1:05 p.m., the game started 1 hour, 26 minutes late. Rain resumed in the seventh and a downpour that caused flash flood warnings halted play at the start of the eighth. Only a few hundred fans from the original crowd of 43,379 remained when play resumed after a 3:11 wait. Shane Greene pitched a perfect ninth for his second save in two days. Masahiro Tanaka (8-10) dropped to 0-6 in day games this year. Yankees reliever Dellin Betances struck out the side in the eighth on just nine pitches. Cardinals 5, Brewers 4: In Milwaukee, Yadier Molina hit two solo home runs, Luke Weaver pitched into the seventh inning and St. Louis held off Milwaukee. Weaver (1-1) allowed five hits, including Eric Thames’ 25th home run. Trevor Rosenthal got four outs for his seventh save. Molina homered in the fourth and then connected off Brent Suter (2-2) in the sixth for his 12th of the season and fourth career multihomer game. Orioles 6, Royals 0: In Baltimore, Jeremy Hellickson threw seven outstanding innings in his Orioles debut, Caleb Joseph homered and Baltimore beat Kansas City to complete a three-game sweep. Playing in his second game with Baltimore, Tim Beckham doubled, tripled and drove in two runs. The Orioles’ five-game winning streak is their longest since early May, and they now stand just 2 1/2 games behind Kansas City for the second A.L. wild-card slot. The Royals had won 10 of 11 before coming up flat at Camden Yards, scoring only three runs in 27 innings. They showed their frustration in the ninth inning, when Mike Moustakas was tossed after complaining about a third-strike call and manager Ned Yost was ejected for joining the argument. Hellickson (1-0) was obtained Saturday from Philadelphia. He gave up five hits. Baltimore went up 3-0 in the second inning against Jason Vargas (13-5) when Beckham hit an RBI double and Joseph homered. Mets 10, Rockies 5: In Denver, Curtis Granderson hit a tiebreaking, three-run homer in the sixth inning, and New York erased a five-run deficit to beat Colorado. Jay Bruce hit his 29th homer and Asdrubal Cabrera had three hits for the Mets, who snapped a three-game losing streak. Yoenis Cespedes added an RBI double and played solid defense in left field. Amed Rosario tripled for his second hit in his second game in the majors. Chasen Bradford (1-0) pitched two hitless innings. Tyler Chatwood (6-12) gave up eight runs in 5 1/3 innings. Marlins 7, Nationals 0: In Miami, Vance Worley pitched seven innings and faced the minimum number of batters to earn his first victory since May 2016, helping Miami beat Washington. Worley (1-2) allowed only two hits, and both baserunners were erased on double play grounders hit by Bryce Harper. Worley lowered his ERA from 6.42 to 5.31 while facing the highest-scoring team in the National League. Dee Gordon tripled, singled twice, scored three times, drove in a run, stole two bases and made an acrobatic defensive play at second base. He extended his hitting streak to 13 games, matching his career high. Teammates Christian Yelich and Derek Dietrich hit two-run homers. Right fielder Giancarlo Stanton leaped at the wall to rob Brian Goodwin of a home run for the final out to preserve a four-hit shutout. A.J. Cole (1-1), recalled from Triple-A to make his second start of the year, allowed five runs in six innings. Reds 5, Pirates 2: In Pittsburgh, rookie Jesse Winker homered for the second straight game, hitting a tiebreaking drive in the seventh inning off newly acquired Pittsburgh reliever Joaquin Benoit that led Cincinnati. Adam Duvall homered and drove in three runs for the Reds. The Pirates have lost eight of 10 following a six-game winning streak. Winker hit a solo shot over the right-field wall with one out in the seventh to give Cincinnati a 3-2 lead. Benoit (1-5) took over to begin the seventh after being traded from Philadelphia to the Pirates on Monday. Michael Lorenzen (6-2) won in relief and Raisel Iglesias closed for his 18th save. Twins 5, Padres 2: In San Diego, Ervin Santana threw a four-hitter for his major league-best fifth complete game and hit a two-run single to lead Minnesota over San Diego. The Twins won for just the second time in nine games. They went 2-6 on a trip through Los Angeles, Oakland and San Diego. Joe Mauer had a double and single to tie Tony Oliva for third on Minnesota’s career hit list with 1,917. Santana (12-7) retired his first 10 batters. He struck out nine and walked one in his 21st career complete game. The Twins jumped on Luis Perdomo (5-6) for four runs on four hits and two walks in the second. Rangers 5, Mariners 1: In Arlington, Texas, Joey Gallo hit another impressively long home run, Andrew Cashner won his third straight start and Texas beat Seattle to snap a four-game losing streak. Delino DeShields and Elvis Andrus also homered for the Rangers, who wrapped up a 3-6 homestand during which Adrian Beltre joined the 3,000-hit club and ace pitcher Yu Darvish was traded away. Mariners lefty Ariel Miranda (7-5) struck out five without a walk in 5 2/3 innings. But he allowed all three homers as Seattle’s four-game winning streak ended. Cashner (7-8) gave up one run over six innings to match a career best with his third straight win. Blue Jays 5, White Sox 1: At Chicago, J.A. Happ struck out a season-high 10 in seven innings, matching his longest start of the season, as Toronto topped Chicago. Happ (4-8) gave up a run and six hits while walking one to get his first win since July 4. Justin Smoak extended his hitting streak to nine games and reached base three times for the Blue Jays, who won two of three in a matchup of last-place teams. Steve Pearce and Josh Donaldson added solo home runs. Roberto Osuna entered with two on and nobody out in the ninth inning, and set down three straight batters to earn his 27th save. Derek Holland (5-11) gave up two runs and five hits with four walks in six innings. Angels 7, Phillies 0: In Anaheim, California, Mike Trout, C.J. Cron and Kaleb Cowart all homered in a seven-run third inning, JC Ramirez pitched eight strong innings and Los Angeles defeated Philadelphia. Trout and Cron hit two-run homers and Cowart a solo shot in the third. It was the 20th home run of the season for Trout. Martin Maldonado hit two doubles in the inning. Ramirez (10-9) gave up six hits and two walks, while striking out three in the longest outing of his career. The victory was the fourth in five games as Los Angeles pulled three games behind the second A.L. wild-card spot. Jake Thompson (1-1) went five innings for the Phillies but surrendered all seven runs – just two earned after Cesar Hernandez’s fielding error – in the third. The Phillies lost to the Angels for the 11th consecutive time. Athletics 6, Giants 1: In San Francisco, Ryon Healy hit his 20th home run to end a monthlong power drought, rookie Daniel Gossett pitched seven impressive innings and Oakland beat San Francisco. Jed Lowrie doubled twice and scored, Matt Chapman added two hits and an RBI and Chad Pinder singled twice and made a sparkling defensive play in left field to help the A’s win on the opener of their five-game road trip. Gossett (3-6) pitched three-hit ball, allowing one run. He struck out five and walked two. Healy, starting at first base in place of All-Star Yonder Alonso because of the pitching matchup, had gone a career-high 24 games without homering before his two-out, two-run drive off Matt Moore (3-11). Published: Aug. 2, 2017, 10:37 p.m.